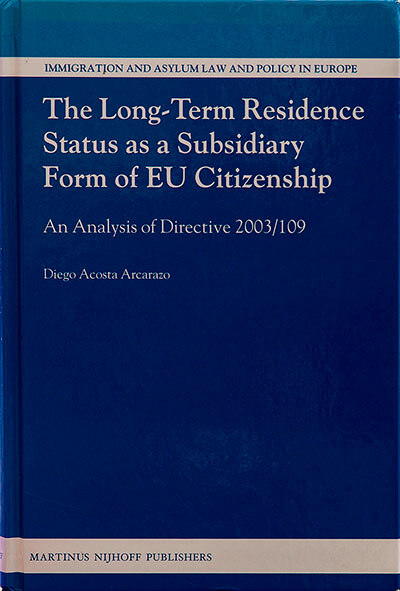 The Long-Term Residence Status as a Subsidiary Form of EU Citizenship. This book studies the implications for third-country nationals of the adoption of the Long-term Residence Directive. This Directive has the potential to become a subsidiary form of EU citizenship that escapes direct control by Member States. Hence, this Directive brings the prospect of transforming Member States’ control over the relationship between territory and population. In order to arrive at this conclusion, the book looks at its content and at the way in which Member States have implemented some of its most controversial articles. It then explores how the Court of Justice could interpret those articles, taking into account its previous jurisprudence on Turkish workers and EU citizens and calling into question the compliance of several national provisions with EU law. Cited by the European Commission in COM (2011) 585 final, Report on the application of Directive 2003/109/EC concerning the status of third-country nationals who are long-term residents, Brussels, 28 September 2011. Sabina Anne Espinoza, European Law Review, 39 (2014), pp. 438-441. Anja Wiesbrock, European Journal of Migration and Law, 15 (2013), pp. 229-231. ‘It is also notable how the author combines the theoretical perspective with an eminently practical vision, frequently deepening in the political motivations which complements the technical and legal analysis and enriches the monograph by the wide use of multidisciplinary literature’). Sara Iglesias Sánchez, Revista de Derecho Comunitario Europeo, 16 (2012), pp. 744-746. What is meant by European Union? The Lisbon Treaty and the Stockholm Programme: What is the Future of Migration Regulation? Is the European Union Construction a “Legal Other”?